The Jaguar F-Type 3.0S is a modern day classic with gorgeous looks and a lovely smooth 3litre supercharged V6 up front. The standard car has a very respectable 375BHP from the factory but here at JF Automotive we now have a ECU tuning package boost that output! We started off by doing a completely stock dyno run on our 2000BHP Mustang rolling road. In totally standard form this car ended up posting 365BHP which considering this is a brand new car was fairly surprising to us, with most modern cars always pulling stock power! 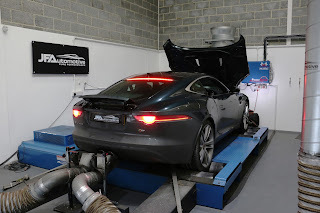 We used our OE diagnostic equipment to scan and check for no fault codes then proceeded with the remapping. First up was a pair of BMC high performance filters. We always recommend these to compliment a remap and allow the engine to breathe easier. They also have the added benefit of never having to be replaced just cleaned and refreshed! 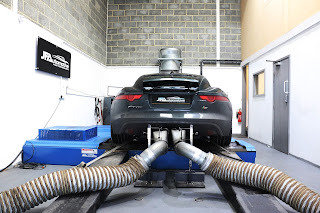 After fitting we loaded our Stage 1 ECU tune and a power run on the dyno. The map was then developed by constant tweaking on the map until we came up with a safe and powerful end product producing an added 50BHP and 47Nm of torque! 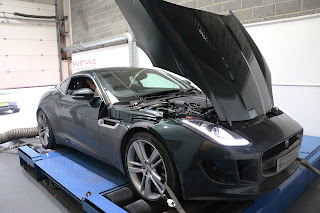 Jaguar have just launched a 400BHP special version of the F-Type and the customer was very happy he tuned instead of paying a lot extra for less BHP!